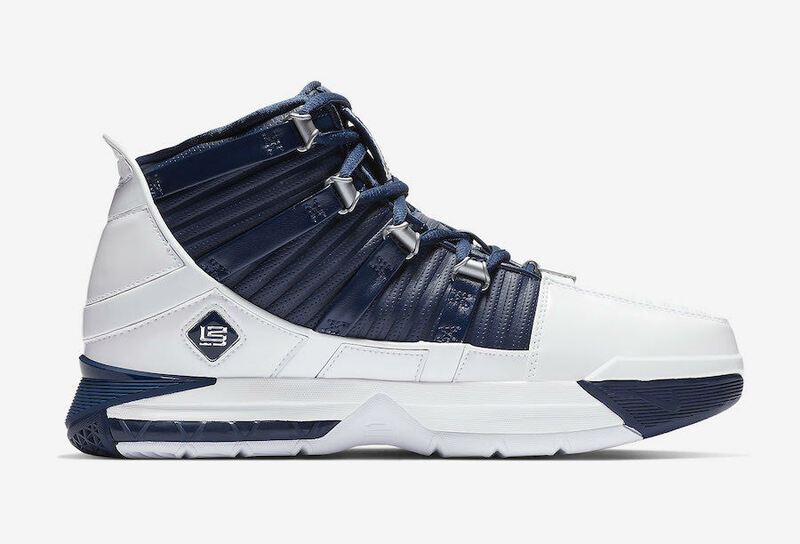 The Nike Zoom Lebron 3 “White/Navy” Releasing 2/8/2019 on UNKNWN.com | RESPECT. Dropping at UNKNWN.com on February 8, 2019, Nike Basketball and LeBron James will be bringing back another original colorway of the Zoom LeBron 3 ahead of 2019 NBA All-Star Weekend. This time its the OG “White/Navy” iteration that originally debuted in 2006. The shoe features a White and Navy Blue upper with patent leather overlays and Silver accents. Other details to this Nike LeBron 3 includes Swoosh logos on the lateral heel, lion’s head on the tongue, and “LJ23” on the dubraes, medial heel, and insole.